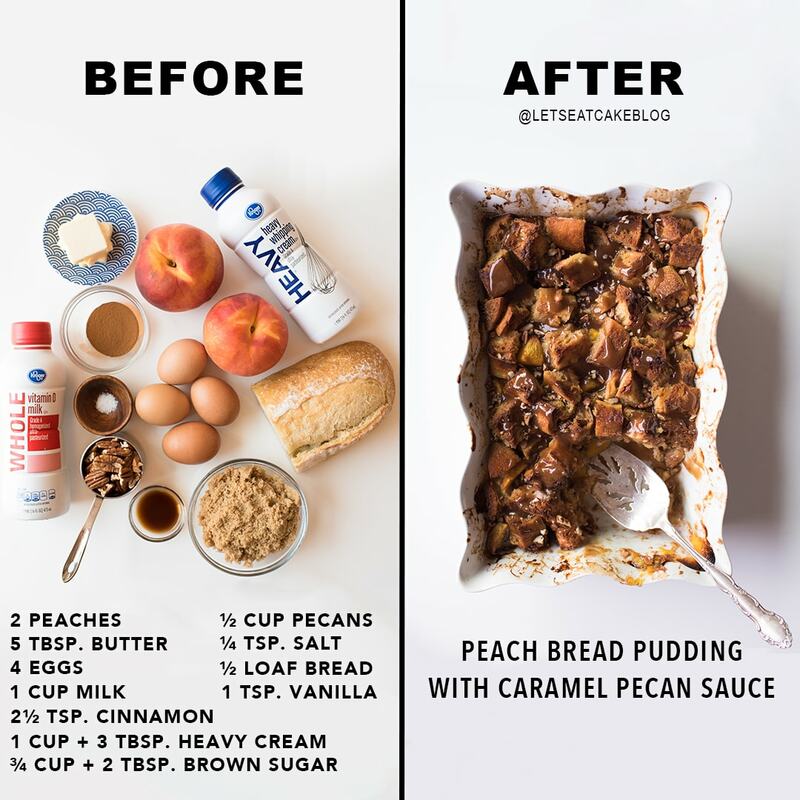 There’s no better time than now to make Peach Bread Pudding with a Caramel Pecan Sauce. It’s the dog days of summer, but peaches are also at their peak, so throw on your lightest outfit, grab a fan and some fresh peaches, and let’s get cooking. Because once you try a bite of this, you’ll be glad you did! 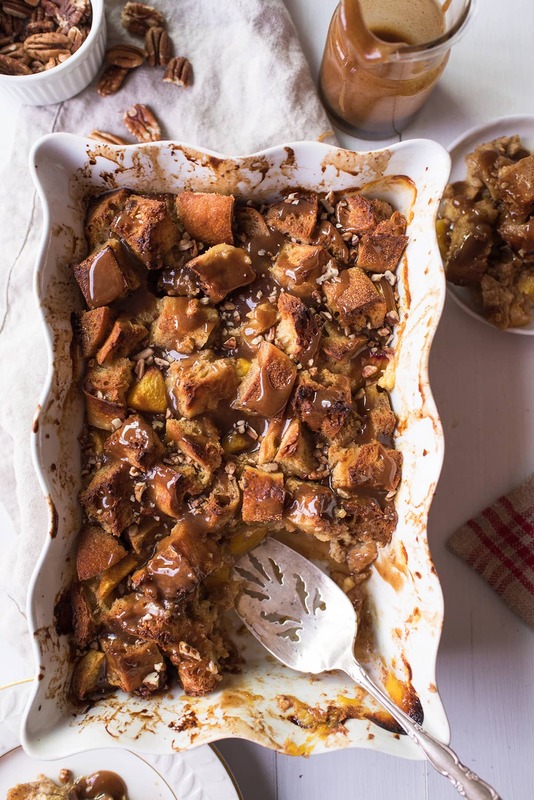 I love bread pudding and this peach bread pudding recipe was inspired by a comment left on one of our most popular recipes, the Bread Pudding with Bourbon Caramel Sauce. A reader asked if we could “add peaches or berries to the bread pudding?” and, to be honest, I wasn’t sure. But, with peaches in high season, it seemed the perfect opportunity to give it a try. I flipped through my favorite book, the Food Bible, for inspiration and worked out the following recipe that’s loosely based on that other bread pudding. Earlier in the summer, I had made an Easy Peach Cobbler with Honey Buttermilk Biscuits. If you recall, I loved the biscuits but couldn’t stand the cobbler part. I’m not sure what went wrong with my taste buds there, because I could easily did eat more than my fair share of this bread pudding standing at the counter with a fork. And it was so easy to make. All you have to do is peel and slice two large peaches and toss them in a mixture of butter, cinnamon, and brown sugar, whisk up a simple egg and milk mixture, cut up some day old bread, combine everything, and bake! If you want to take it over the top, though, I highly recommend the caramel sauce. As long as you have the patience to keep stirring the mixture, you can make it. I did use a candy thermometer (read: infrared heat gun) so I didn’t overcook it, but you can certainly eyeball it. When it’s rich and thick and dark brown, remove it from the stove and pour it on top of the bread pudding. As with all bread pudding recipes, I recommend using day old bread if you can. If you don’t tend to keep bread in the house, simply buy a loaf at the store the day before and leave it out on the counter. I usually use challah — like I did in this Bread Pudding with Vanilla Sauce — but I grabbed a delicious rustic Italian loaf at my neighborhood Ralphs — and I’m so pleased with how it turned out. The stiffer structure of the Italian bread resulted in a crunchy top layer that matched perfectly with the caramel sauce. If you compare this bread pudding to my previous ones, you’ll find it calls for an entire loaf of bread instead of half. I increased it because the addition of fruit means there will be more juice that needs to be absorbed and because I was insistent upon using a deeper baking pan because it was prettier. If you are equally stubborn and use a 8 x 12 x 4″ baking pan like I did (instead of a 9 x 13 x 2), bake it for 20 minutes longer. It’s also important to use great ingredients, but especially so with simple dishes like this. Quality eggs, milk, bread, and cream make so much of a difference. My go to heavy cream has become the Kroger brand heavy cream. I love it because it’s rich, thick, and always at stock at Ralphs! What bread pudding would you like to see me make next? I’m thinking pumpkin or cranberry, but tell me in the comments what you want to see! 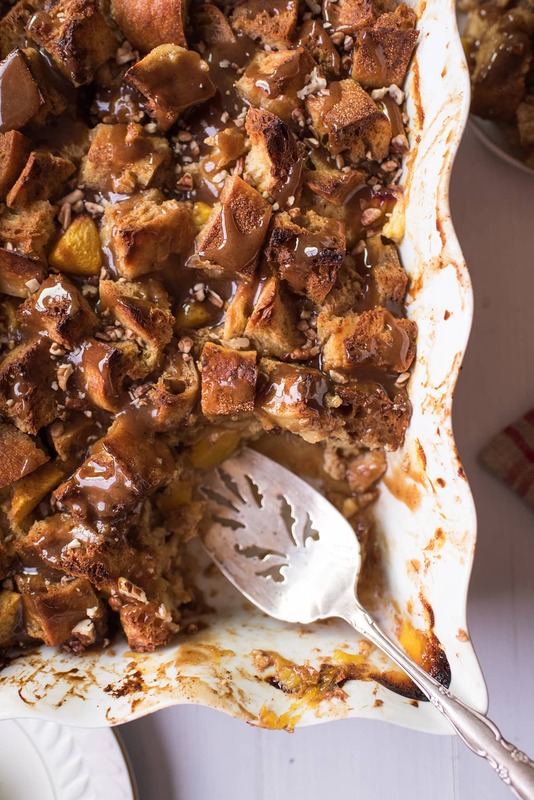 This Peach Bread Pudding with a Caramel Pecan Sauce is the best way to end summer! Combine eggs, whole milk, heavy cream, sugar, vanilla, salt in bowl. Set aside. Combine peaches with melted butter, cinnamon, and brown sugar. Place in prepared baking dish. Pour egg mixture over bread and let stand for 5 minutes. Submerge bread. Refrigerate for one hour. Preheat oven to 375°F. Bake for 50 min. up to 1 hour, 10 minutes. Top should bounce back slightly when pressed and custard should be thick. Top with Caramel Pecan sauce and serve. Mix sugar, cinnamon, and salt together in small bowl. Melt butter in saucepan over medium-low heat. Add sugar mixture to saucepan, stirring continually until fully combined. Remove from heat and add heavy cream carefully, stirring continually. Place back on heat. Stir and cook caramel until thick, bubbling, and medium brown in color, about 5 minutes. Cover and store Peach Bread Pudding in the fridge for up to 3 days. If using deeper baking dish (like a 8” x 12” x 4” pan as shown in the photos), cook for longer and use one full loaf (1 pound) of bread. 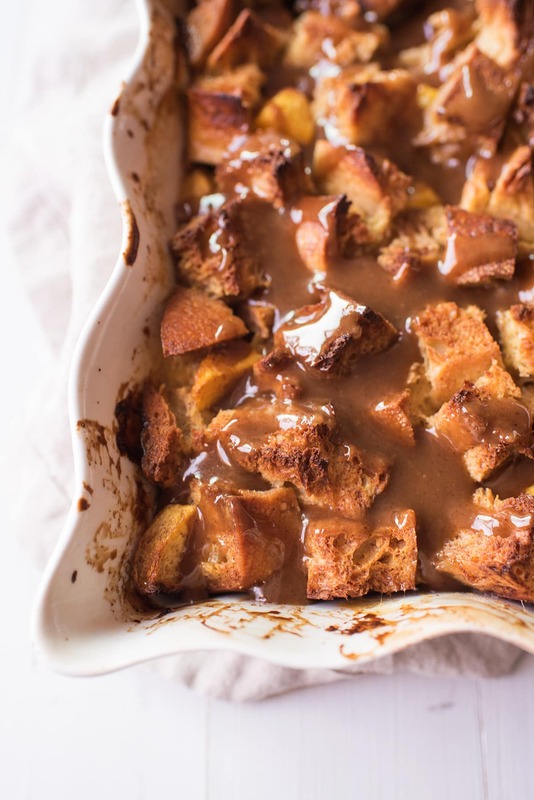 Love a good bread pudding recipe and the caramel topping is perfect!! This recipe looks indulgent and heavenly! Well, I do believe this is the most decadent bread pudding I’ve ever laid eyes on! You’ve upped the ante on my favorite dessert! Oh my, this bread pudding looks so decadent and delicious! I can’t wait to try this recipe! Thank you! It was really hard to resist just stealing pieces off the top once it was poured on! I love peaches in any form plus this sauce looks fantastic. Can’t wait to try this recipe.Thanks for sharing. That’s the best before and after photo I’ve ever seen! This looks and sounds so delicious. I’m a sucker for anything with caramel, but with the peaches and pecans – oh my goodness! Oh.my.gosh. Everything about this looks perfect. I love caramel anything. Your pictures are gorgeous! That peach addition makes it so fresh and all together it is such a yummy summer dessert! What a beautiful pud! Love anything with peaches, so this is definitely something I will be trying out in a very near future! Just looking at the pics makes my mouth water! We have been getting the BEST peaches lately. They would make this bread pudding absolutely perfect! Can’t wait to try this out. I’ve been looking for a little more “peach” inspiration and you’ve hit the nail on the head! I want this like right now! Simply mouthwatering. Living in New Orleans, bread pudding is part of our culture. I can’t tell you how many times my friends ask me where to get it local when they visit but I bet this homemade version is so much better! I needed to be at that table when you took these pictures. This dessert looks so good! I love peach recipes this time of year! This looks soo yummy!! Can peach season last forever? The list peach recipes I want to try keeps getting longer! Adding this to the ever growing list!